Ill Seen, Ill Said: New at Coterie! Over the weekend, I did some shop updating. In ceramics, I added two styles of berry bowls and a gorgeous cylinder bowl that I would serve a big summer salad in. The patterns on these porcelain pieces are pressed using wooden textile blocks that the (Toronto-based) artist collected in Tibet. As always, I'm drawn to objects with a balance of traditional and contemporary styling. 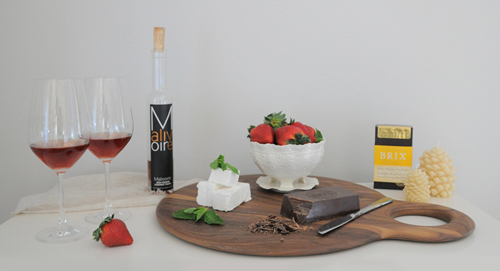 For the photograph above, I paired some organic strawberries with Malivoire Cabernet Franc Icewine (which is perfect for pairing with red berries), some Brix wine-pairing chocolate and a handful of homemade marshmallows from Xococava. It was a perfect summer dessert, simultaneously light and luxe. 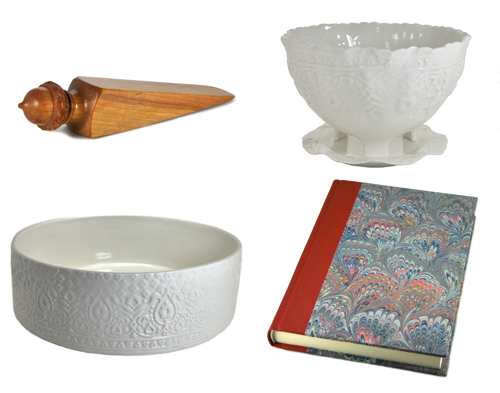 My wooden products have sold fast, but I added a few last items there too. I have more coming (literally in the mail) so will photograph and list them as soon as they land! And, yes, rest assured there are plenty of muddlers coming for those of you dreaming of summer cocktails. The Canada Post strike is ongoing. It's a rolling strike and their website claims "business as usual" in the non-affected areas. If you place an order and I discover anything to the contrary, I will let you know what your delivery timelines are likely to be or whether I've selected an alternative shipping method.